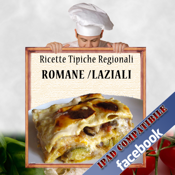 More than 100 recipes with all the best dishes you can find in historic inns and quaint restaurants in Rome and Lazio. The cuisine of Rome and Lazio and "Italian-food". The traditional cuisine of Rome choses simple but hearty ingredients and intense flavors and gives us the ancients. Rome has defended over the centuries (better than what was done in other areas of Lazio and other Italian regions), their genuine respect the past and ignoring trends, managing to keep the taste pure and simple a kitchen extraction people. Travel with us and be surprised to discover new tastes: from the fried dishes of meat, condiments "very nutritious" the bizarre and unusual combinations of ingredients. And, finally, a dip in the sweet variety of traditional regional desserts. Main features: All the recipes and any application is now available in four languages: ITALIAN, ENGLISH, SPANISH AND RUSSIAN. Each recipe is accompanied by a picture of the finished preparation in high resolution. Categorization: Appetizers, soups and hot soup, first course (pasta and timbales), meat, fish, fried and fried vegetables, dessert (sweet and savory pizzas.) For each recipe you will find: title, category, difficulty, preparation time, cooking time, recommended wine (where Reviewed), details of ingredients, preparation of text, image + high resolution icon. Each recipe can be shipped complete (including images) by email or by Facebook. You can by clicking add ingredients to shopping list and check just as you are at the supermarket, so do not forget anything! And there's more, other features of the service are: the chance to put the recipes in the library, to find a dish by name, ingredients or preparation. You can also change the recipe in every aspect, from the description to the title, from ingredients to personal notes. You can also enter new or change the image if you have cooked the dish you want to replace that system with your dish prepared! All this along with dozens of other features all included in the first of the new series 'traditional regional recipes'. We look forward to our table! Download it now at the lowest price in the store, on sale for only the first period of 7 days!